The 7th Workers’ Party of Korea (WPK) Central Committee held its second plenary meeting on October 7, 2017. Although the gathering had no major policy implications, it was most likely the DPRK’s most significant domestic political event in 2017 because of a series of notable personnel appointments to the WPK’s power organizations and to the Central Committee itself. The most significant changes were the elevation of economic officials to more influential positions in the party hierarchy, demonstrating Kim Jong Un’s commitment to economic development. It is also significant that the status of the new North Korean Foreign Minister, has been elevated within the party structure, giving him a more direct role in key decision-making bodies. Kim Jong Un’s report to the plenum, which focused on domestic economic development, signaled no major policy changes. From Pyongyang’s perspective, what they are doing now, and what they’ve done since the 7th Party Congress (and even before that), is working for them. There is no logical reason to change course now. Moreover, any major policy proposals are more likely to emerge during the next meeting of the Supreme People’s Assembly, where substantive follow-up to policy and personnel announcements publicized during a party gathering usually occur. Much of the media attention about the Central Committee plenum focused on the elevation of Kim Jong Un’s younger sister and close aide, Kim Yo Jong, to Alternate Member status on the WPK Political Bureau. This establishes her as one of the top 20 officials in the DPRK’s formal political hierarchy. It is highly likely that her election during the October 7 meeting publicly formalized a status she has held at least since April. In her capacity as Deputy Director of the WPK Propaganda and Agitation Department (PAD) and a member of Kim Jong Un’s executive office staff, not to mention being a member of the Kim family active in North Korean politics, Kim Yo Jong already had some of the perks of office commensurate to a Political Bureau member, particularly access to a variety of reports and policy documents. Kim Yo Jong’s public promotion establishes her as the successor to her aunt, Kim Kyong Hui, who held not only full member status on the Political Bureau but also a nebulous position and policy writ in the central party. Her new status (taken with the demise of half-brother Kim Jong Nam in February) formally and conclusively establishes the family line of Kim Jong Il and Ko Yong Hui as the sole legitimate successors (the main “branch” of the family tree) to Kim Il Sung. There is one lingering question, however, about Kim Yo Jong’s upward migration. 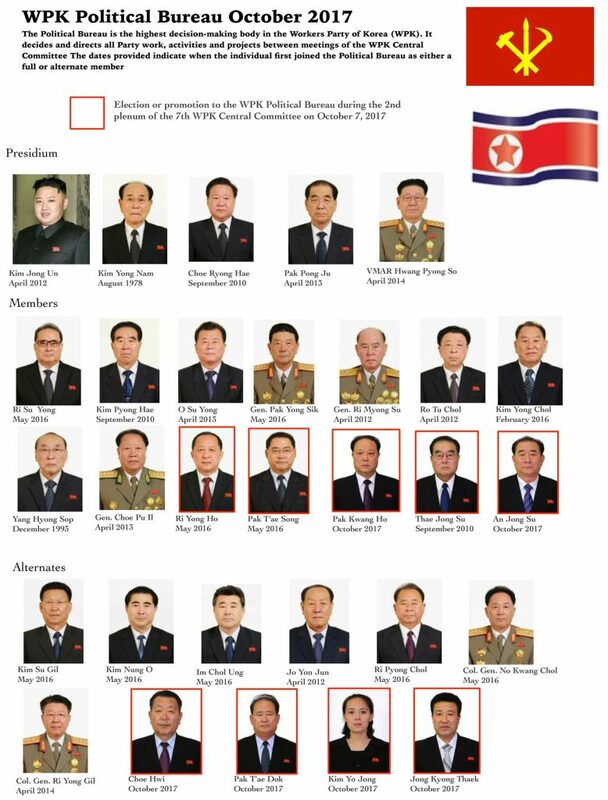 While her promotion indicates that her policy portfolio is not restricted to daily administrative activities at the WPK Propaganda and Agitation Department, nearly all members and alternates of the WPK Political Bureau are elected by dint of their party, state or army positions (i.e. their day jobs). The WPK Vice Chairman, DPRK Premier, and individuals who hold one of the three Korean People’s Army (KPA) top high command positions automatically have Political Bureau status. The deputy director of the PAD is not one of those positions. So what does her appointment represent? Is Kim Yo Jong a kind of at-large representative for the millennials populating mid- and low-level positions in the regime? 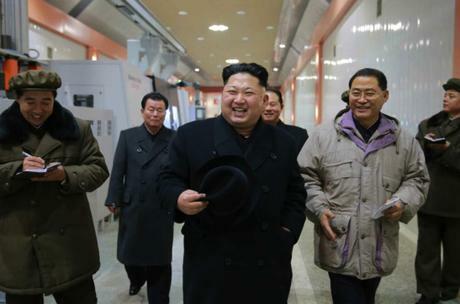 Has Kim Jong Un expanded the PAD’s representation on the Political Bureau? Or is she the representative of Kim Jong Un’s executive office, the Personal Secretariat? The Little King of Everything? Choe Ryong Hae is probably the big winner to emerge from the Central Committee plenum. After the meeting, he moved up two notches in the formal hierarchy and is once again the regime’s No. 2 official after the nominal head of state Kim Yong Nam, a position he previously held from 2012-2014. He was also appointed a director of one of the WPK Central Committee’s 20-odd departments and elected a member of the WPK Central Military Commission after a three-year hiatus. DPRK Foreign Minister Ri Yong Ho,, who has been prominent in the news lately over his remarks at the United Nations on the North Korean nuclear issue, was promoted from an alternate member of the WPK Political Bureau to full membership. He is the first Foreign Minister to have full member status on the Political Bureau since 1983. Ri’s career advancement during the last 18 months has been relatively rapid, having been elevated in the Central Committee and Political Bureau, appointed Foreign Minister, and given membership on the State Affairs Commission. Ri’s elevation to full membership on the Political Bureau is as much about installing a highly respected, professional diplomat as it is about the Foreign Ministry attaining full representation on one of the party’s supreme power organizations. This position provides him a direct connection to The Center and puts him in the room when strategic decisions are debated and decided. Should Ri conduct meetings with foreign officials, his interlocutors can rest assured that Ri has a direct channel to convey outside perspectives on key diplomatic issues. Ri Yong Ho’s career advancement needs to be taken in the context of Kim Jong Un’s longer term goal of shoring up a variety of foreign relations and external affairs channels. This is not an indication that the DPRK will somehow be more outward looking in its policies or decision-making. It is a matter of the country getting its house in order when, or if, the time for substantive interactions takes place. The plenary meeting also saw the dismissals and replacements of several WPK Vice Chairmen and the elevation of several economic officials to more influential positions. It will take some time before Pyongyang watchers will be able to reliably identify what specific policy areas all these new vice chairmen have been tasked to lead. We do know that the Vice Chairmen for Munitions Industry, Science Education, Propaganda and Agitation and Planning and Finance have been replaced. It also appears that the number of WPK Vice Chairman and Central Committee Departments has grown. Three new WPK Vice Chairmen stand out because of their close ties to Kim Jong Un’s rise to and consolidation of his power. Pak Thae Song is a former deputy director of the WPK Organization Guidance Department who came into prominence after Kim Jong Un assumed power five years ago. Since the succession, he has served as a close aide to Kim Jong Un. In 2014, Pak was appointed Chairman of the South Pyongan WPK Provincial Committee. When he was appointed, he was tasked to supervise the renovation of the January 18 General Machinery Plant, the leading production unit in the DPRK’s manufacturing of rocket and missile engines. As part of the renovation, Pak was also tasked to ensure that the plant innovated and expanded its production of rocket engines. During the 7th Party Congress, Pak was elected an alternate member of the WPK Political Bureau. After the Central Committee plenum, Pak is now a full member of the WPK Political Bureau and a WPK Vice Chairman. 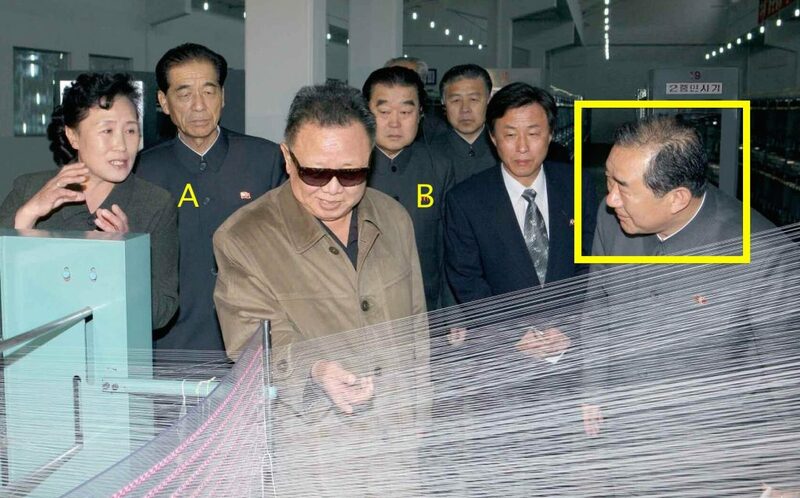 An Jong Su (annotated) briefs Kim Jong Il on a factory visit in 2011. Also in attendance are Thae Jong Su (B) who was also appointed WPK Vice Chairman and WPK Political Bureau member on October 7, 2017 and DPRK Premier Pak Pong Ju (A). An Jong Su is a former senior DPRK Cabinet official. He has close ties to DPRK Premier Pak Pong Ju. A competent and experienced manager in the light industry (consumer goods) sector, An was appointed Minister of Light Industry in June 2010. He migrated to the WPK Central Committee apparatus as Director of the WPK Light Industry in 2014. Kim Jong Un does not visit consumer goods production units (at least publicly anyway) nearly as often as his father, but when he does, An has almost always been in attendance. An has been appointed a full Political Bureau member and WPK Vice Chairman. His appointment is linked to the implementation of the Five Year State Strategy for Economic Development. After the second plenary meeting of the 7th WPK Central Committee, the DPRK leadership has subtly and gradually shifted its media messaging and programming (i.e. the propaganda) away from some of the more heated rhetoric and activity that we have seen during the last six months. Much of Kim Jong Un’s report to the Central Committee and many of the personnel changes to the central party power organizations focused on the economy. While the North will still formulate and release interesting statements, and we might see one or two more ballistic missile tests, the DPRK’s political culture is probably moving on to the KPA’s winter training cycle and preparations for the cold, resource-challenged winter. While one does not doubt what “single-hearted unity” and “Mallima speed” can accomplish, there are limits. The results of the second plenary meeting are an unfolding event. Kim Jong Un and his image makers have met us halfway by holding a large gathering and revealing who was appointed to what power body. But Pyongyang watchers will need subsequent state media reporting to determine where some of these officials have landed and what policy areas consume their daily lives. It would be unwise, however, and possibly dangerous to read these personnel appointments as simply a matter of reshuffling deck chairs on a sinking. Several elderly officials have been effectively retired. And if the DPRK were embarking on a course of action that might result in the country’s total annihilation or even the strategic shock of a surgical strike, then such things as policy statements and personnel shuffles would be unnecessary. Individuals, and nation-states, with a death wish don’t make long-term plans. Typically, back in the old days (until 1993), the WPK Central Committee used to hold a plenary meeting the day before a Supreme People’s Assembly session. Despite the establishment of the Kim Jong Il-Ko union as the “main branch,” it is interesting that the invisible hand of Kim Kyong Hui was felt during the Central Committee plenum which is indicated by the elevations both Kim Yo Jong and Choe Ryong Hae. The latter of whom had especially close personal and patronage ties to Madame Kim. If the Kim Jong Il-Ko union is being established as the “main branch” what does Kim Yo Jong’s elevation mean for her half-sister Kim Sul Song? Kim Sul Song was influential under Kim Jong Il and that appeared to carry over during the transition to Kim Jong Un. Sul Song has been a highly reticent public figure and preferred working behind the scenes. During the mid-2000s she held a similar position that Kim Yo Jong now holds—coordinating security, logistics and media coverage for Kim Jong Il. Kim Yo Jong’s elevation could partially indicate that she publicly represents members of the Kim family who have pledged their fealty to Kim Jong Un. On the other hand, Kim Jong Nam’s murder and Kim Yo Jong’s elevation to the Political Bureau could be a warning to other family members to fall in line. This is especially relevant to a potential fourth-generation hereditary succession. Sul Song is one of two daughters from Kim Jong Il’s sole “official” (as in recognized by Kim Il Sung) marriage. She also has a son who would be in his early 20s. According to the best information available, Kim Jong Un and Ri Sol Ju have not produced a male heir. During one of the wakes for Kim Jong Il in 2011, North Korean state television broadcast footage of Kim Yo Jong leaving the line-up of mourners. When she did so, she led four then-senior DPRK officials: the head of the ROK-focused United Front Department, the then-head of the WPK Munitions Industry department and the then-daily manager of the State Security Department. These senior officials behaved highly deferentially around Kim Yo Jong. This may have been purely out of respect for her and the occasion, but it also may have represented some of the policy areas in which she is involved. Another PAD official elevated to the Political Bureau was former PAD deputy director Choe Hwi who was elected an alternate member of the Political Bureau and WPK Vice Chairman. Interestingly, Choe and Kim Yo Jong appeared on the same Department of State sanctions list in 2016. The Personal Secretariat and employees thereof are seldom mentioned in DPRK state media accounts. In fact, employees and senior officials, at every level, of the Personal Secretariat do not use job titles indicating where they really work; instead they use cover job titles from one of the two WPK Central Committee “control tower” departments—PAD or the Organization Guidance Department (OGD). This use of cover positions conceals where these individuals actually work while at the same time entitling them to the social welfare benefits and perks commensurate to the cadres and workers who actually work in those departments. Choe is a genuine North Korean princeling, being the son of former defense minister and Kim Il Sung partisan comrade Choe Hyon. During the 1970s, Choe Hyon was a critical supporter of the hereditary succession of Kim Jong Il and the loudest voice in the room advocating that Kim Jong Il succeed Kim Il Sung because the former was the eldest son of the latter. Choe Ryong Hae’s career appears to have been affected by the WPK Organization Guidance Department. He has never been a member of that twisted priesthood and it has been telling that he was replaced at the GPD by Hwang, an OGD man through and through, and that Choe was subjected to disciplinary actions in 2015 by the head of OGD’s administrative affairs section, Jo Yon Jun. Interestingly Jo, OGD’s most senior deputy director, was appointed Chairman of the Inspection Commission (a.k.a. the Control Commission), a position which is typically appointed to elderly and experienced OGD personnel (such as Mr Jo) who entering a period of semi-retirement. If this has not been uttered or reiterated enough, Ri Yong Ho (like Choe Ryong Hae and Kim Yo Jong) is himself a princeling being the son of Ri Myong Je, a now-deceased former deputy director of the Personal Secretariat. The elder Ri managed the residential compounds inhabited by Kim Jong Il and was a key figure in establishing the Kim family’s footprints in western Europe through which Kim Jong Un would eventually study in Switzerland, Ko Yong Hui received medical treatments and the Kim Family would be able to deposit its money in European banks. Ri Yong Ho has peripheral ties to Kim Kyong Hui (as did his father). When Ri began his education as a diplomat, Kim Kyong Hui was involved in personnel appointments to the DPRK’s diplomatic corps in her capacity as then-senior deputy director of the WPK International Affairs Department. Based on North Korean general practices on personnel appointments at the time, her reach would have extended all the way down to diplomats-in-training. The last DPRK Foreign Minister with Political Bureau status was Kim Yong Nam, currently the SPA Presidium President and nominal head of state. Foreign Minister Ri Yong Ho’s “wick of war” was based on remarks he gave to a Russian delegation during a visit. While it certainly has some significance, it did not originate with a Foreign Ministry read-out or formal statement and, like Tweets, should not be construed as a policy statement.